Have you ever heard someone say, “I had one of those days today.”? I call “one of those days” a shell-stickin’ day. You know how some hard boiled eggs refuse to let go of the egg white? If you’re making deviled eggs and you need the white part to be intact as a nest for the egg yolk mixture, you know how aggravating one of those shell-stickin’ eggs can be. I’m sure you’ve had to give up on some eggs in the process, because invariably chunks of the egg white tear off and leave half nests that just won’t work. I’m the stubborn sort and I’ll go to great lengths to fight a shell-sticker, searching for that crucial place where the thin membrane is holding onto its beloved egg white. In 50% of the cases the egg wins and I either eat the mutilated egg white and throw the yoke in with the batch of other yokes or, depending on how many shell-stickers in the batch, decide to make egg salad instead of deviled eggs. It’s sort of the egg version of when you have a lemon make lemonade. But what can you do when you have one of those shell-stickin' days? The other day was a shell-stickin’ day that refused to give me a break from one negative situation to the next. It started off when I woke up and thought it was about 6-ish. I looked at the clock and it was 3:41. Argh! At that early time it’s a tossup whether my body will go back to sleep or start its day. It decided to start its day. That afternoon, on my way to a doctor’s appointment for a pain in my leg that's been hanging around like an unwanted tune that keeps repeating in your mind, I was listening to the radio and this guy was being interviewed about his involvement in The 48-Hour Project. I was intrigued especially when he said he was from Ridgefield, Washington about five miles from me. He said there are 150 chapters around the US and Portland, Oregon was going to show their 11 winning films that night at the Hollywood Theater. I love old movie theaters and it sounded fun. The guy said each film is about seven minutes and the people involved in making the films draw a genre out of a hat (comedy, horror, western, chick flick etc.) and they have 48 hours to produce a movie. He said a few years ago one of his films got shown at Cannes. I was impressed and talked Terry into going that night. I now realize no one in his right mind and who has a talent for making movies would ever agree to make a movie in 48 hours in the first place! I can understand the fun in a race to the finish, but when a final product is involved, that product is for sure going to be less than a final product that took the time it needs to take to be good. I’ve always appreciated quality products that reflect the time it takes to create them, and a movie thrown together in 48 hours is going to reflect just that, a movie thrown together in 48 hours. To give you just a sense of that part of my shell-sticken day, the best of the 11 quickies we endured was a horror movie in which the serial killer was a Roomba. (Perhaps the creators thought they'd chosen the comedy card.) I think I’d better have enjoyed watching 11 elementary school talent show films. The popcorn was really good, but when I hobbled out of the Hollywood Theater, I felt bad I’d drug Terry into this. When you have one of those days, the best thing you can do is to realize how great your life is the majority of the time. Maybe we need a few of those shell-stickin' days to truly appreciate all the good in our lives. Here’s to those shell-stickin’ days, may they restrict themselves to coming once in a blue moon. P.S. Speaking of "time" I love finding ways to slash time from projects without affecting the end result. I thought up the idea of disguising the faces on our currency as a way to give cash in a creative and humorous way as a gift. It's not too late to start thinking of Christmas gifts and money is a great gift especially for teens. When you purchase the Stick it Right on the Money Gift Giving Kit and because of The 48 Hour Project, for the next 48 Hours I'll send you the download of ELM (Everybody Loves Money) with 10 clever cash-giving ideas. Today is September 11 and my gift will run through tomorrow September 12 at midnight. 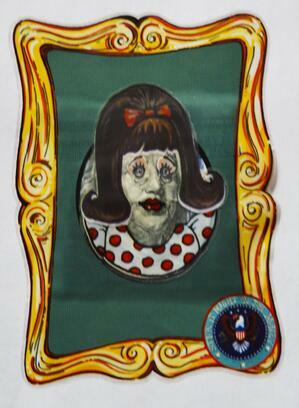 Just click on Ben Franklin framed and disguised with on of 88 sticker disguises. Thank you! I hope you share my blog with a friend who just might be having a shell-stickin' day.